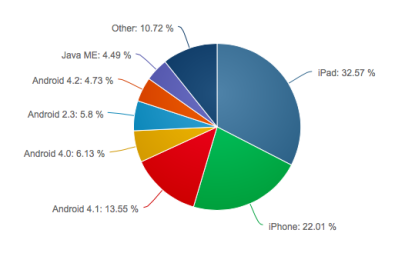 So what Android dominates device shipments with a 80% market share and Apple is dropping down at 14%. NetApplications’ November 2013 report shows that Apple still rules the mobile internet space contributing to 55% of traffic to internet from devices. 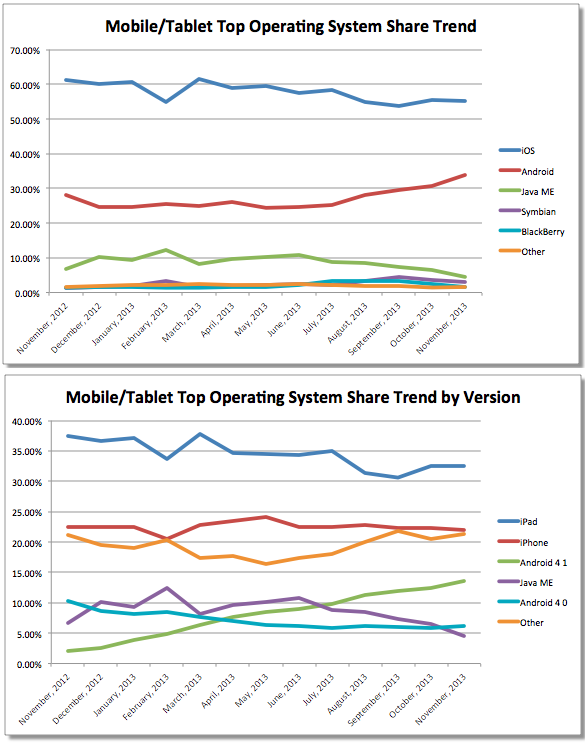 Apple has been loosing on the mobile internet share over the last 12 months given the onslaught of Android devices. 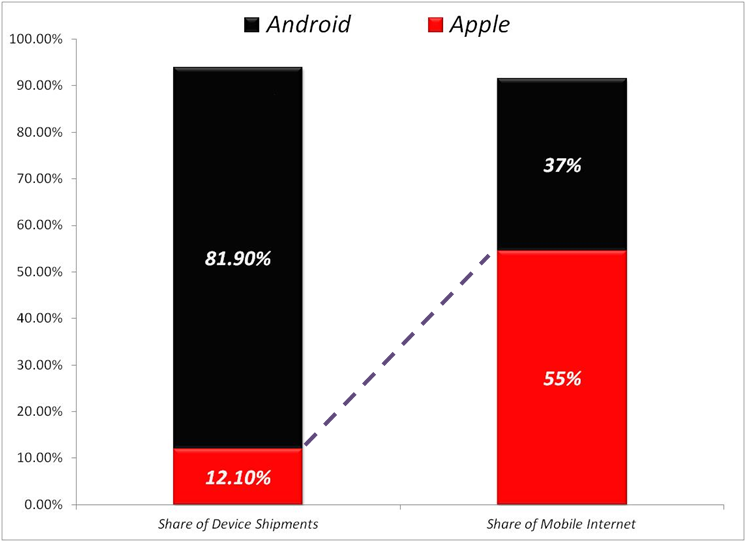 Given that Apple is now reduced to a minority with no low end presence to take on the might of the Android’s, this share is set to fall further. These numbers appear miniscule against a 975 million sub base in Indian Telephony. But these small numbers signify more than just numbers – these stats indicate usage and habit of data consumption which is on a up-swing in Indian data context. Sample Bharti Airtel’s quarterly results – which saw it posting slow down in profits for 12th successive quarter- big jumps in customers’ data usage are remarkable to note. The following extract from the result statement show – data use per customer rose 21% and the number of customers using fast 3G wireless data networks rose 29%. 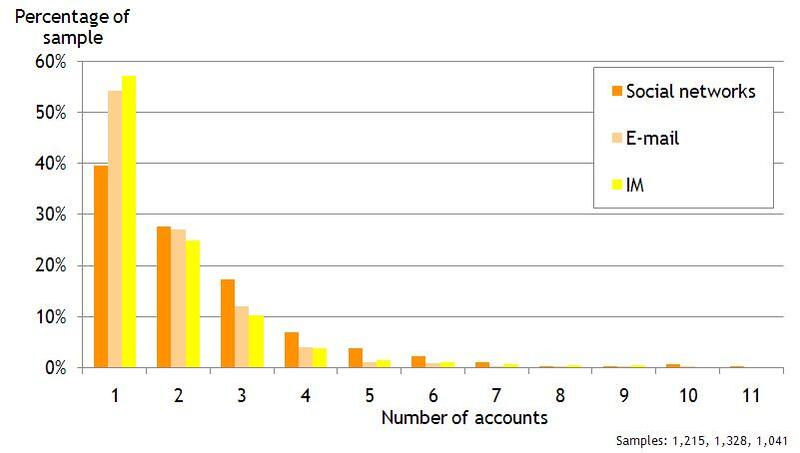 This is not the single point of data as last year’s Nokia Siemens Networks reported 78% increase in 3G data traffic. 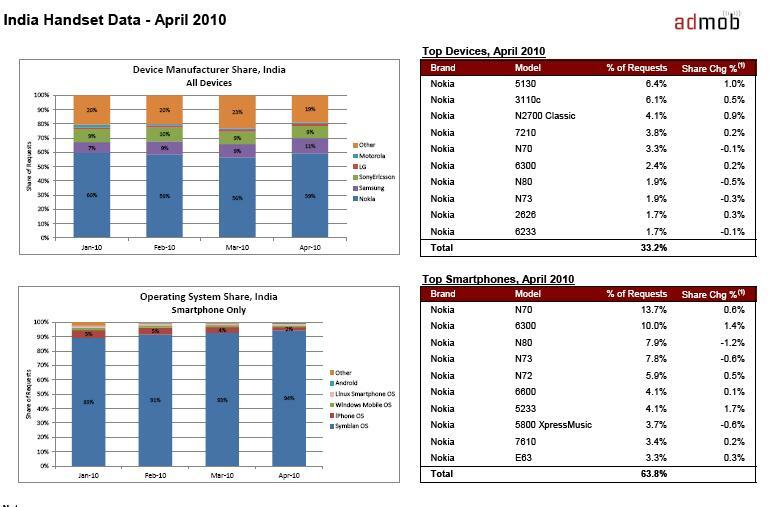 In its report, based on data from 290 million Indian mobile data users, Nokia Siemens pointed out that mobile phones were the preferred medium for internet access in India, with 81% of data users saying they used their phones primarily for web browsing. Another 17% used their phones mainly for watching videos or listening to music. Thus India and its mobile savvy 925 million subscribers is gobbling up data and is on the verge of a data revolution on small screens. The India Internet scene thus is delivering as was expected with Internet and Entertainment consumption spiking on mobile screens. With erratic power supply it is a natural tendency to fall back on phones to deliver information and entertainment on the small screen. What complements the cause is the fact that the mobile phone screen is the single most viewed screen on a daily basis. Howwever the best part is the significant upside that is awaiting – Internet penetration in India is lower at 11-12 per cent compared to other Asian countries (South Korea and japan have 50% data usage penetration levels). Even the densest penetration urban zones in India are only 39% penetrated. While a lot of it is to do with the infrastructure in India Compared to US, which has six carriers of 3G with 30 Mhz of 2G and 60 Mhz of 4G whereas India has an average bandwidth of of 8 Mhz of 2G. In few of my earlier posts, i have blogged about Applications based Internet delivery as the future of Internet. To me applications are far more superior internet mediums because of the versatility of the purposes they can solve (and so, There’s an App for that); the always on and always connected nature of apps and the API-led integration across all web based resources. The other benefit of Apps include the fact that Mobile apps using Web technologies are easier to build & deploy on multiple platforms. Also, Apps are activity led in terms of being mobile and not just relaying static information, but making dynamic linkages with various engines and APIs to present most relevant results. Daily interactive consumption has changed over the last 12 months between the web (both desktop and mobile web) and mobile native apps.With profusion of apps and with a large multiple of results basis how one App interacts with its environment, there are search engines for Apps returning the exact thing needed by relevance, instead of returning just the pages coherent with the search string.Thus Apps will be a better discovery medium of the web and the trend of Apps super-ceeding web pages is “on”. 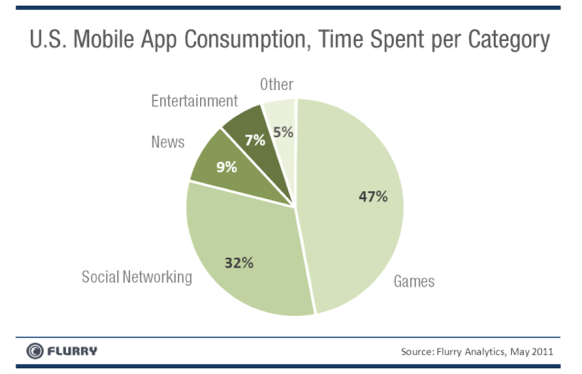 Mobile App analytics firm, Flurry says that daily time spent in mobile apps has now surpassed web consumption. The average user now spends 9% more time using mobile apps than the Internet. 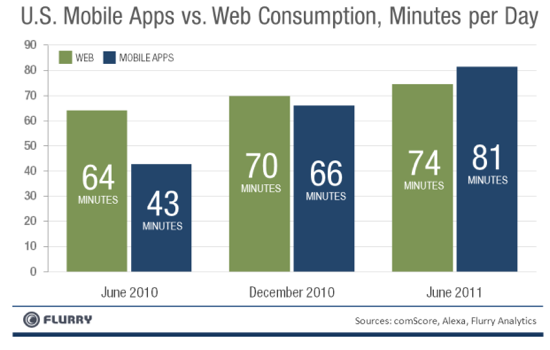 In June users spent an average of 81 minutes daily on mobile apps, compared to 74 minutes on the web.This compares to 66 minutes on mobile apps daily in December of 2010, and 70 minutes spent daily on the web. And June, the average user spent just under 43 minutes a day using mobile applications versus an average 64 minutes using the Internet. As smartphone usage continues to grow, we’re going to see more tech companies pursue aggressive mobile strategies and with Mobile Internet, the key delivery medium will be Apps. Whats also working in favour of apps will be the ability to integrate dynamic content into the App and enhance the user engagement. Social networking has become one of the key services driving uptake of mobile Internet access and Facebook, with its 600 million users is the most popular social network for mobile usage in all countries. Furthermore researches and surveys have proven that even though most SNS users typically use Facebook as the default option, half of them also use one or more other social networks. The mix of social networks used shows that handset manufacturers should preload apps for Facebook, YouTube and Twitter in all countries. But there is also a case for ensuring that users can access MySpace, Flickr and the two largest local players, which typically come in as the third, fourth or fifth most-popular social networks in our survey. Without these, a significant percentage of users will find that their PC usage of social networks cannot be taken across to mobile as they would like. The use of Facebook is also changing, with surveys showing that it is now increasingly being seen by users as a primary channel for mobile e-mail. Facebook is being used for e-mail by 30 percent to 50 percent of mobile e-mail users. It is used as a second account by more than half of the users of all other e-mail services. Given the nature of social networking as a driving force in mobile Internet usage, plus the strength and rapid growth of Facebook within that, Facebook’s role as an e-mail and IM medium is destined to increase and begin to threaten established providers such as Microsoft, Yahoo and Google. Mobility has touched the lives of 50% Indians and with the launch of 3G and enhanced spectrum, the numbers would see a bigger boost. As discussed in an earlier post, India is now going through a Data revolution. More and more people are accessing internet through their mobiles phones. Here are a key factors enabling the spread of Mobile Internet in India. 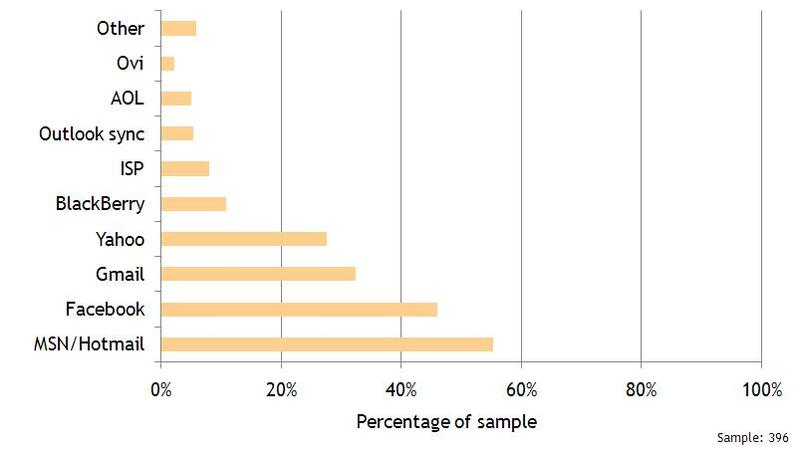 In 2011, Smartphone search rates are expected to exceed PC search rates of 2007. In India alone, the GPRS users are estimated at 20 to 25 million, which is also estimated at 40% of desktop Internet users. Over 2009 internet traffic from metros from India grew 2.5X times other global carriers: Nearly half of this traffic was from Mobile phones. Data from Admob shows that Internet traffic is mostly based on Feature phones accessing Internet through WAP sites. However, the smartphone penetration is also increasing across the country and 3G compatible devices are breaching the Rs.5000 mark. This provides an opportunity to replacement consumers to buy into higher end devices which have greater internet capability than the earlier devices. With the smartphone entry price points close to the 5K, the browsing game now shifts from Mobile WAP browsing to full scale HTML browsing. While the former is optimized for Mobile, uses minimal navigation is quick loading and is without Frills to suit the limiting computing power of the mobile, full HTML browsing offers PC like browsing experience with multiple page support. The browsing experience will be aided by Location, direction and motion sensor, web apps and rich media experience. Mobile internet is set to surge see a surge as data plans now break down the price barriers and more and more competitors increasingly commoditize the voice revenues streams. 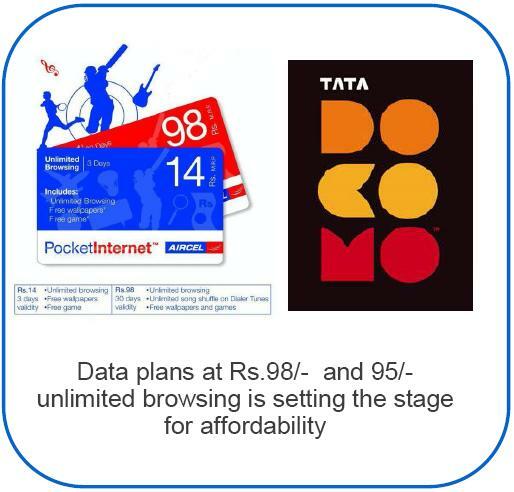 A survey by Google puts the entry threshold for mass acceptance of data plans to Rs.100 per month citing that the volume increment in that case is a 5X multiple. As we go along, data revenues will continue spiraling downwards to the point of pay per downloads. Two cases of Iran in 2007-08 and Algeria in 2008 prove the direct correlation between data plan affordability and surge in Internet traffic numbers. A combination of the four factors has been and will be the driving force behind India’s Mobile internet growth in the near future. In a few earlier posts, i had lamented the lack of data traffic focus in TELCOs in India. Given the tariff war, hyper-competition and the near advent of 3G and the necessity to augment voice incomes, TELCOs in India are changing their focus very ostensibly from Voice to Data Traffic. 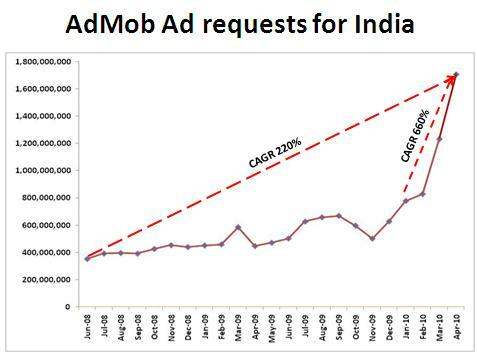 Ad Mob’s mobile ad requests for India is a surrogate measure but then it carries home the point that internet on Mobile is here and here to stay for good. 2. Increased traffic volumes will bring in economies of scale reducing prices and making Internet more accessible to more people. 3. The strong eco-system that is beginning to take shape with Telcos, OEMs, ODMs, Developers and Consumers will further drive compelling content that will drive data traffic. The internet and data habit is quickly becoming mainstream and the TELCOs and other VAS players are pleasantly surprised and are hoping for an extended run into this source of revenues. The growth registered in the last 4 months in India was also forecasted study by Cisco released in February 2010 projected that India has the highest country mobile data traffic growth rate of any country, with a CAGR of 222% from 2009 to 2014. The study says that annual global mobile data traffic will reach 3.6 exabytes per month or an annual run rate of 40 exabytes by 2014. Such a figure equates to a 39-fold increase from 2009 to 2014, or a CAGR of 108%. If AdMob is to be believed, these numbers are happening already. The same survey also concludes that by 2014, more than 400 million of the world’s Internet users will access the network solely through a mobile connection. The rapid consumer adoption of smart phones, netbooks, e-readers and Web-ready video cameras as well as machine-to-machine applications like eHealth monitoring and asset-tracking systems, is continuing to place unprecedented demands on mobile networks. In spite of the economic downturn, the demand for mobile services has remained high, posing both challenges and opportunities for service providers worldwide. I shall be exploring the opportunities and challenges that the proliferation of Mobile Internet will be bringing to the Indian context in my next blog. ABI Research predicts that 2013 smartphone downloads via smartphones will peak. Last year, consumers downloaded 2.4 billion applications from application stores – a figure that’ll almost treble by 2013, when almost 7 billion apps will be downloaded. Growth will not be steady – 2010 will see a major jump in downloads over 2009. From there , growth will be predicted to be relatively steady through 2013. applications stores are not going away by 2013, but rather they will peak and the number of downloads by 2015 will have only decreased by 7 or 8 percent. Apple’s App Store will remain the market leader until 2013 according to ABI’s report, despite pressure from Android and Symbian. This report however is handicapped by specifity of devices kept only to smartphones only and not taking into account feature phones. 1. Carriers plan to launch their own application stores, which will extend the principle of downloadable applications to feature phones. This means access to newer and developing markets where smartphone penetration is lower. 2. Evolution of the mobile internet will then lead to consumers starting to head away from dedicated stores for their software applications. Total app downloads will probably continue to grow, although downloads via app stores are expected to fall. Users will download apps from the home sites. 4. Platform Fragmentation will pose to be challenge for the Apps stores and the developers community. 5. With so many apps and so many stores, indexing the best Apps and increasing their discoverability for consumers is also going to be a critical piece for greater depth in terms of usage and greater width in terms of number of consumers. Read Earlier posts about the Apps A to Z of Applications here. This is a repository of the kinds of action and stuff that could and would happen at the Apps front in the near future. In continuation of my earlier post discussing the key terms of the Mobile VAS and Mobile Apps globally, this is the follow up post on the key terms N to Z. This list would serve as a reckoner for people associated with Mobile VAS And Apps globally as a glossary. Many of the terms and concepts discussed in this glossary are very profound in there implications and carry the force to alter the way people interact with mobiles and communication itself. Relevant Mobile Apps like Money Transfer, Education, Healthcare can be a very significant change in many regions and economies globally.